Free WiFi, private entrance, private kitchen/bath, private bedroom. Beautifully furnished, quality linens, fully equipped kitchen, Garden views from the kitchen. The unit is on the garden level of the brownstone and the private entrance has one flight of stairs, not handicap accessible. Digital keys are available for initial access once booking is confirmed. 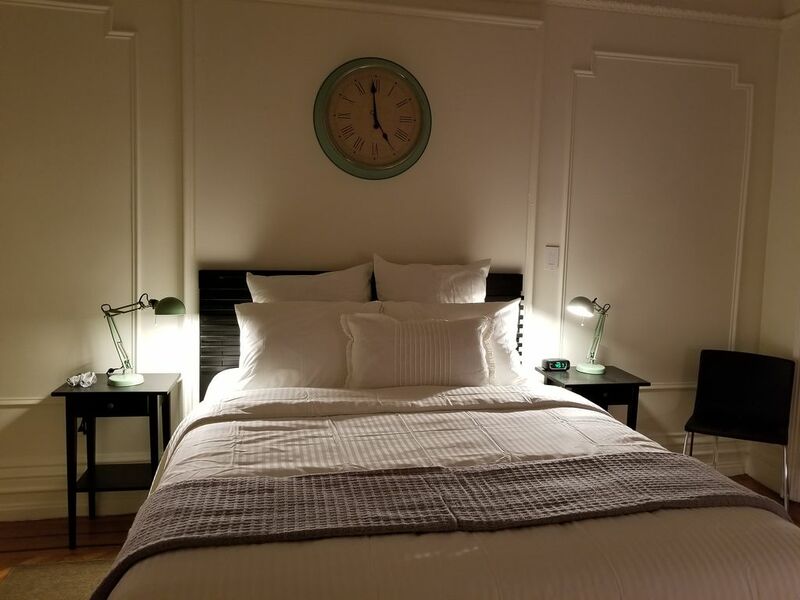 The bedroom is private and has a queen size bed with a sitting area for reading or just enjoying the view from the front of the tree lined quiet block, this room has a marble fireplace (non-working) with a flat screened smart TV and SLING TV steaming. There is also a desk/work space to plug in a laptop or write notes. The open living room area has a full sized sofa bed and can sleep 2. This room is open to the galley kitchen which is outfitted with stainless steel appliances, stone counter tops and fully equipped with dishes and cookware, if you will like to cook. The dining area is also located in this area next to another marble fireplace and seats 4. There are 2 comfy chairs and a cozy reading nook to lounge or watch TV. The window view from this room is onto our garden area where in the warm months the roses bloom and my little dogs play. Thank you for your interest in our Home, the Owner-Occupied MACON MEMORIES. I am Brooklyn born and raised and love my City. NY has so much to offer and I am always finding wonderful things to do. I restored my 19th century home over the years and am so proud of it. I love to entertain and hosting comes natural. I take pride in showing and telling visitors all our city has to offer. I will be happy to give you suggestions to help make your visit one of the best. My family and I love to meet new people! We are located on a quiet, tree-lined street in the heart of the beautiful, safe, and culturally vibrant Stuyvesant Heights Historic District of Brooklyn, New York (which, along with its sister community of Bedford, is commonly referred to by the amalgamated name “Bedford-Stuyvesant” or “Bed-Stuy”). Brooklyn, of course, is the true cultural center of New York City, or as GQ has rightfully called it, “the coolest City on the Planet” Built in 1901, MACON MEMORIES is located on a quiet, peaceful, Neighborly block, just steps away from the best the Neighborhood has to offer – an ever-expanding list of bars, boutiques, cafés, galleries, restaurants, and much more. The swiftness with which these types of amenities are popping up is a reflection of the fact that Bed-Stuy is the fastest-growing Neighborhood in all of New York City! Totally private stay, I don't share the space. I am available for any questions as I reside in the building on another floor. Just 10 minutes to NYC, via A/C subway or buses, which are only a 2 minute walk from the home. 7 minutes to Barclay Center and downtown Brooklyn/DUMBO area by car or subway, 15 minute bike ride. Located in historic Stuyvesant Heights. 2 blocks from Fulton Street which has banking, dining, shopping and there are so many fabulous brunch and dinner restaurants and lounges all within walking distance. I'll provide a list of options with addresses when you check in. There is an abundance of public transportation with subways located only 2 blocks away, bus lines at the corner of the block, as well as NYC Taxi, UBER, LYFT and private car service. Must climb one flight of stairs to private entrance. This one bedroom apartment is adorable! Adelle provides you with everything you need. It was clean, spacious and safe. Not too noisy outside from traffic. So many walkable places to visit, including my daughter’s apartment! There are a lot of great shops and restaurants and no tourist crowds. I would definitely recommend this place to anyone (especially my family members who want to visit my daughter) who are visiting Brooklyn. Thank you for staying with us, it was a pleasure to host you and I hope to see you again!!!! The apartment is tastefully decorated with a comfortable bed. The kitchen is well equipped. The wifi works! Adelle has obviously gone to a lot of trouble to make it a nice place to spend time. My husband and I would stay here again for sure. What a beautiful place to stay. It’s away from all the hustle and bustle of town, but the subway is just a few blocks away if you want to go explore! Adelle has thought of literally everything you could possibly need. We had a wonderful stay, and will definitely stay here again! I'm so happy you enjoyed your stay, we welcome you all back and you were great guests!!! Beautiful unit with. Large rooms and complete kitchen. Conveniently location 2 blocks from the Metro and with good supermarket nearby and many convenience shops and laundromat. Our host was always contactable and very obliging. It was such a pleasure meeting and having you and your lovely wife. You were great guests!! Come back anytime! We enjoyed very much our one week stay at Adelle's flat. The appartment is modern, elegant and very clean with everything you should need for your holiday. Placed in walking distance to subway and shops. Adelle is very nice host. I strongly recommend this place!!! I loved having you all as guests, beautiful family!!! Thank you for taking such great care of the rental, I hope you come back soon! Thank you Martha and Steve, it was so nice to meet you and the family. You were ideal guests and we welcome you back anytime!!! Brooklyn, NY is filled with activities for foodies, children's activities, nightlife, museum, arts, Broadway show and small theaters.. as well as fantastic theme parks. Coney Island has everything from arcade games, to miniature golfing, classic roller coasters and fun water themed rides. Shopping is plentiful at the new Citipoint center downtown Brooklyn and on Fulton Street, which is one of the largest shopping venues in Brooklyn. The Children's museum and the beautiful Brooklyn Botanical Gardens are attractions with tons on interactive displays and events..
Brooklyn's Prospect park offers opportunities to picnic, attend a farmers market, horse back ride, kayak, ice skate and a multitude of special events are always scheduled year round.